ROOK: Naturally Coloured Pink Buttercream Frosting! 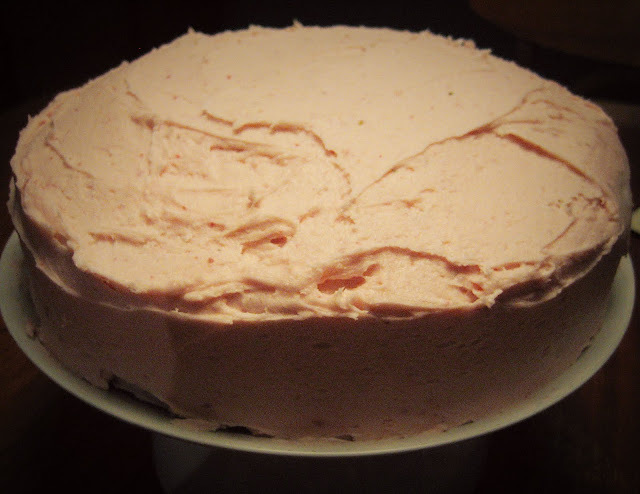 Naturally Coloured Pink Buttercream Frosting! Disclaimer: The photo is supposed to look "nostalgic" and was a pretty poor attempt at using Photoshop. So please excuse it! A couple of weeks ago it was a special little girl's birthday and we brought a cake to a playdate. A pink cake was requested and I had run out of food colouring, plus I don't really like giving fake colour to my kids. So I made this really delicious pink frosting using strawberries to colour it! It was also much more delish than food-coloured stuff! Put your butter and sugar in either a food processor or stand mixer and mix until well blended (a few minutes). Add your puree gradually (while mixing) until the frosting is light, fluffy, pink and tasty. The cake pictured above was a Buttermilk layer cake and I put some sweetened strawberry puree (left a little chunky) in the middle and then slathered the outside with the buttercream. It turned out better than I could have imagined. Licking the bowl was the best part!